There was another chapel, accommodating about 300 worshippers (on another site about 50 yards away in Old Street, purchased in 1835 for �0 & enlarged in 1865, which had become too small) in use by the Primitive Methodists before this new chapel (pictured here) was erected at a cost of almost �24. The architect was Mr J. Grosvenor and the builder was William Russell. The five foundation stones were laid on 10th August 1870 and the chapel opened on 16th April 1871. It measured 65 ft by 36 ft with a circular cove roof supported by 10 cast iron columns. There were galleries on three sides. It could accommodate about 800 worshippers.There was a Sunday school attached with spacious classrooms underneath the chapel. It was described at the time as "one of the largest, if not the largest, place of worship" of that denomination in Shropshire. 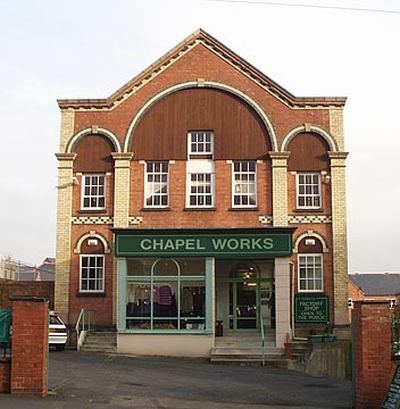 The chapel closed in 1958 & has been converted to commercial use.